Only 10 seconds are left on the clock, and both teams are putting the finishing touches on their pieces. 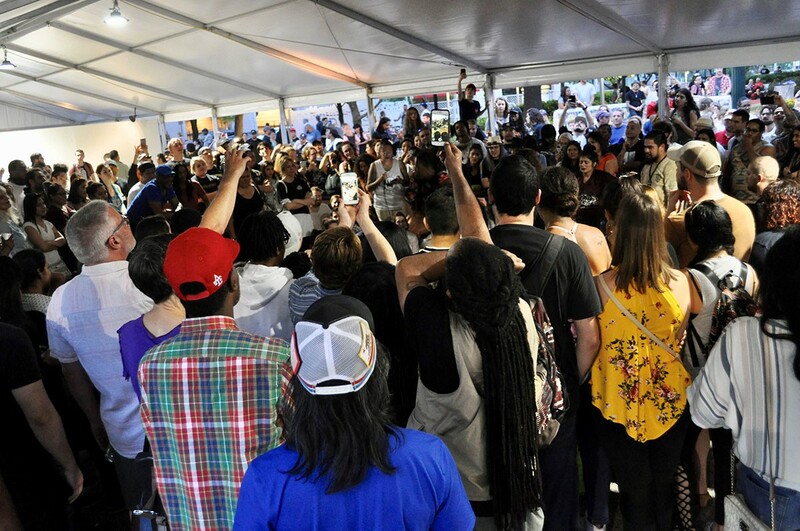 The crowd – a raucous group of at least 200 Houstonians – are cheering loudly and waving their cellphones around to capture the energy of the moment and share their videos on Instagram. 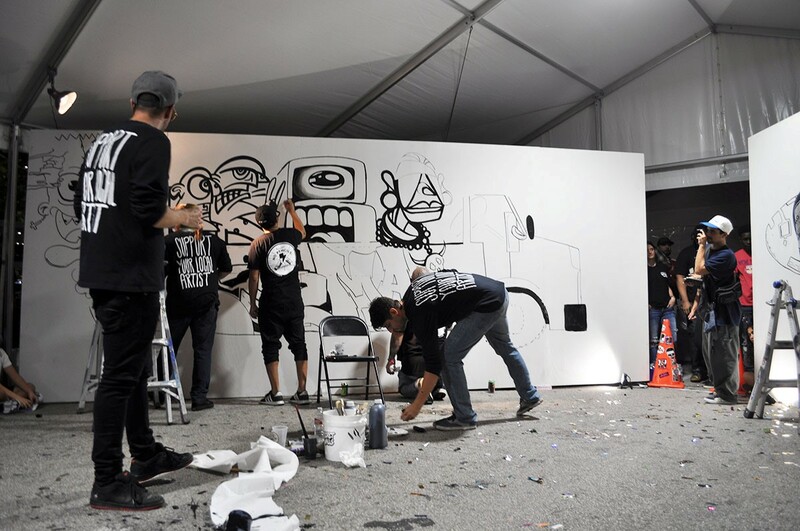 This may sound like some version of Cupcake Wars, but in fact, it’s Secret Walls – a live illustration battle where some of the best artists from around the world, armed only with black markers and black paint, compete to create the best mural in 90 minutes. “The easiest way to explain is that it’s a visual rap battle,” says Secret Walls founder Terry Guy, an England native who now lives in Los Angeles. Since 2006, when Secret Walls first premiered its concept in a bar in East London, the battle has spread throughout the world, hosting the tournament in cities ranging from Tokyo to Sydney to Berlin. On Saturday, April 6, the tournament came to Houston for the third time. Held in Market Square Park, the event was presented by the Downtown District and UP Art Studio. The rules of Secret Walls are specific and distinctive. The artists are divided randomly into two teams, and they are only given black markers and black acrylic paint, which they use to coat their white walls with any images. In Houston, the two walls were 8 feet high and 20 feet wide. The artists cannot use any reference materials, and because they find out the teams immediately before the competition, they do not have a chance to pre-plan their work. They have exactly 90 minutes to complete the murals, a time limit that Terry took from the rules of soccer. This sense of community is palpable even during the event. Although it is truly a competition where only one team can win, the artists are clearly having fun and not taking themselves too seriously. At one point during the competition, Brazilian artist Studio FLOP, who was on Team 1, snuck up behind members of Team 2 and streaked them with a black marker, prompting Team 2 to do the same to their opponents. “It’s more about fun and just seeing what the other artists are going to produce,” said artist Erik. “I think I missed out last time because I was so headstrong about winning.” Erik participated in the Houston event in 2016. Once the 90 minutes were up and the works were complete, it was time for judging. Each of four local judges had one vote, while the audience served as the fifth vote – whichever work they cheered for in higher decibel received their vote. 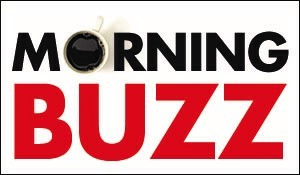 The judges were Tina Zulu of Zulu Creative, former Rice University football star and current real estate icon Dan Zimmerman, renowned illustrator and poster artist Jermaine Rogers and Tipping Point owner Thomas Nauls. Ultimately the winner was Team 2, with artists Chaz from The London Police, JC Riviera from Chicago, Mez Data from Austin, Dread (aka Robert Munro) from Denver and Jake Merten from Los Angeles. 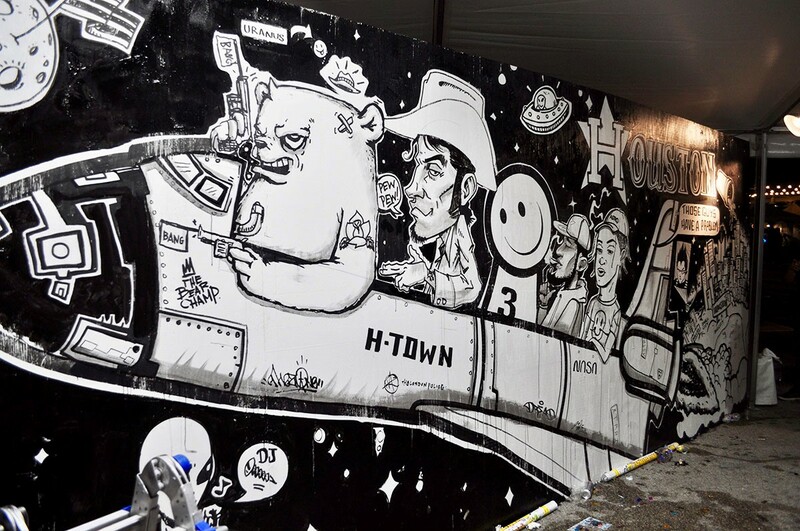 Team 2’s mural was a tribute to Houston, as it depicted a spaceship with Houston figures such as rapper Travis Scott, along with the Houston skyline. It even played to Houston’s ongoing feud with Dallas, with a label that read “big city” over the dramatic Houston skyline and a label that read “small city” written over a measly collection of short buildings representing the city of Dallas. 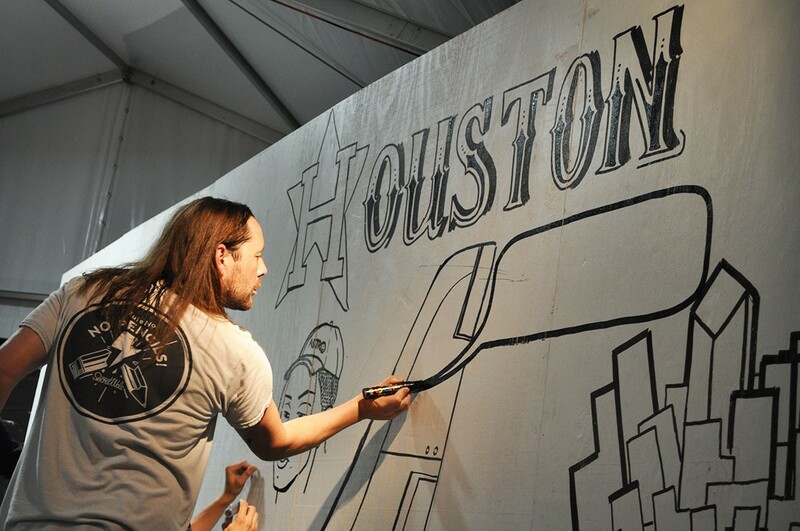 Team 1 featured both Houston artists Erik Delrio and w3r3on3 (Gelson Danilo Lemus), along with Matt Gondek from Los Angeles and Galo from Italy. 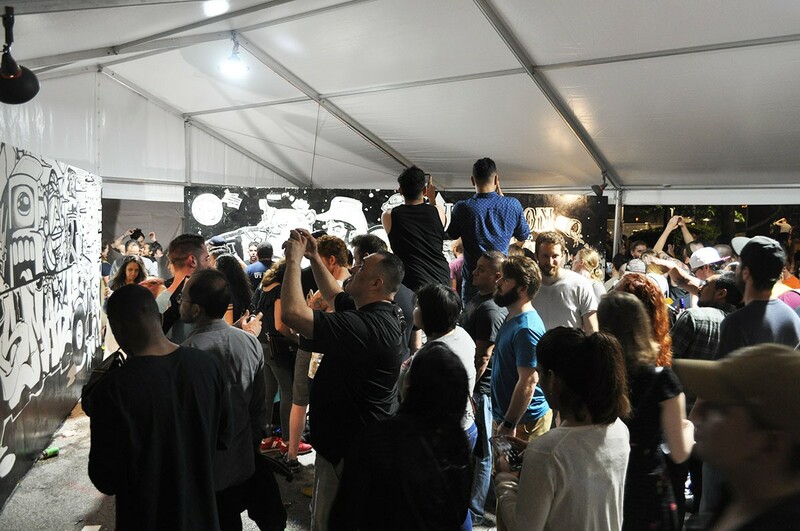 As soon as judging was complete, hundreds of attendees rushed towards the murals, trying to take a closer look and take selfies with the works of art. Elia said that UP Art Studio plans to repurpose the walls, taking them to other art festivals where they participate. Next up for Secret Walls, Terry says he’s planning a tour where Secret Walls visits smaller cities that are not necessarily famous for their art scenes. And he also wants to work with schools through a project he calls “School Walls,” where students get a chance to collaborate with each other to create art.